Oh wow, it's been how long since I've made a Buick update?! Way too long, but, rest assured that I've been hard at work. When I left you last, I was having some major frustrations with my car's windshield glass and transmission reassembly. My windshield is comprised of two separate panes of glass that are separated by a rubber divider. The gap between the two panes needs to be about 1/2" but while my gap was almost adequate at the bottom of the panes, the top portions were touching. When my dad and I tried prying the panes to increase the gap we cracked one of the panes. My fix for this problem was to mark the top of the good windshield about 3/16" from the edge. From this line I stretched some masking tape down to the bottom corner creating a taper. I took this to the glass cutter and had him grind off the protruding portion and then use that as the pattern for the new piece of glass I would need. The glass cutter did all this work in a matter of days and promptly forgot to call me to tell me my order was ready. After a few weeks I finally gave them a call and picked up my new (and expensive!) glass. I believe the window's rubber gaskets would flex more easily in warm weather and luckily autumn in the northeast had been exceptionally mild. With warm weather still lingering I decided to go ahead with the install using the same rope and soapy water in the channel trick that I've detailed in the past. With me on the inside of the car pushing the glass from behind and my dad on the outside pulling out the rope, we had the glass and gaskets in place in just a few minutes. To my dismay there was still an uneven gap in the divider area in spite of having the cutter taper the glass slightly! It was then that my dad started to try and push the windshield into place from the outside. Thinking he was an idiot and about the break the panes again, I pressed my hand on the backside. Lo and behold, between the two of us repeatedly pressing on opposite sides of the glass and sliding our hands toward the A-pillars, we were able to slide the panes over enough to insert the divider rubber. On the third try, my car finally has a windshield with no cracks, gaps or problems! 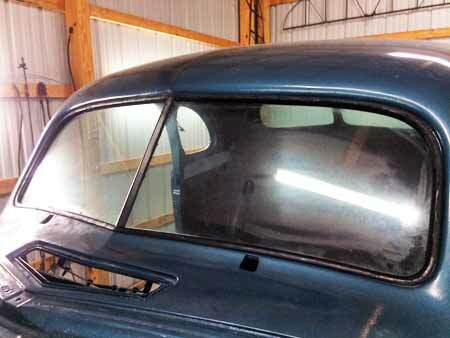 The windshield panes are finally in the Buick! Moving on to my transmission, my frustrations with the transmission cover were solved in an almost unbelievable way. 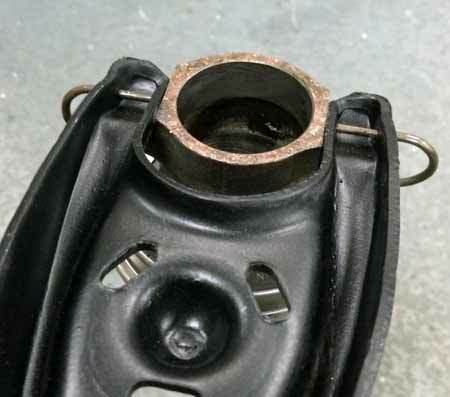 The transmission cover has to line up perfectly with the main case while it depresses a pair of detent springs and allows free movement of a metal slider that holds the bottom of the shift lever. I had tried dozens of times to get things lined up and, for one reason or another, failed each time. One day, after the transmission had sat on the side in my garage for weeks, I went in to the building to assemble a part on an airplane that my dad and I had purchased years ago. When the airplane job was done I looked across the building at the transmission and thought, "what the heck, let me give it another try right now." I grabbed the appropriate wrench, lined things up and tightened the bolts. To my incredible surprise, I had put the cover back on perfectly! The springs were in position, the top slide was free and my transmission was back together; all I had to do was ignore it for a few weeks! With continued warm weather in November, I took the opportunity to do a final cleaning of the transmission then applied etch primer and top coated it with Eastwood's Extreme Chassis Black. About this time I started thinking about installing the transmission into the frame when it dawned on me that I had never installed my car's clutch, pressure plate, throw out bearing or bearing fork. I was now going to have to do a job cramped and on my back that would have been simple had I done it before installing my engine into the frame! Aside from limited access, this task was relatively straightforward. I set the clutch plate against the flywheel and then positioned the pressure plate loosely in place. From here I found an appropriate clutch alignment tool that shifted the clutch plate into perfect position. I was then able to tighten the pressure plate bolts, alternating sides and torque levels. An example of a clutch alignment tool in my clutch plate. Next I had to install the throw out bearing fork. 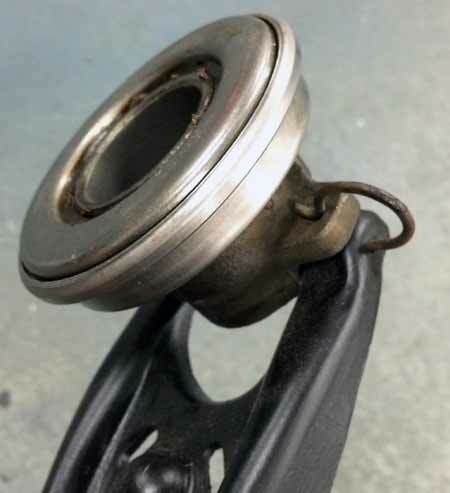 This fork is the connection between the clutch pedal and the throw out bearing and it pivots on a ball nut mounted inside the flywheel cover. The fork is held in place by a circle clip. With clean access this could be mounted in a matter of seconds. With just a few inches between the flywheel cover and clutch pressure plate, installing that circle clip is a major pain. Once enough pain had been given, I had the fork in place and addressed the throw out bearing. My old (top) and new (bottom) throw out bearings. The style changed since 1937 but they are still made in the USA. 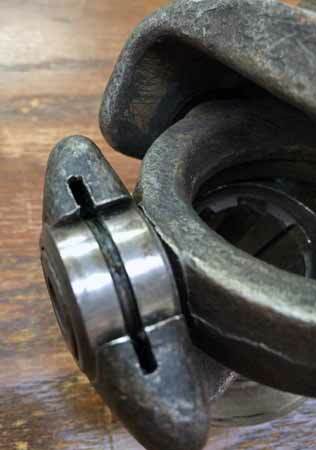 The throw out bearing is simply pressed on to a cast iron shaft. 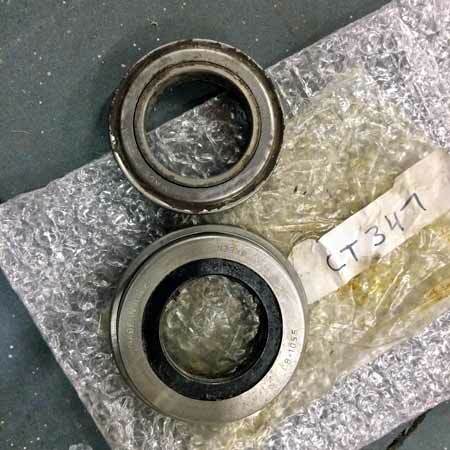 After the old bearing was out, the new bearing was pressed right on. 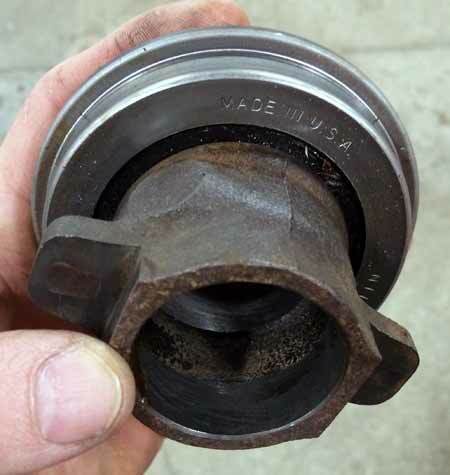 When you operate the clutch pedal and the engine is spinning, this bearing is what makes contact with the clutch pressure plate fingers. Without this bearing the clutch wouldn't work and if the bearing is worn out or damaged it will emit some horrible noises. The bearing and shaft are mounted to the fork by two pins, allowing some side to side movement. New throw out bearing pressed on to its shaft. Throw out bearing shaft mounted to fork with clips. Another look at how the clips secure the bearing shaft to the fork. One more look showing how the clips secure the bearing shaft to the fork. 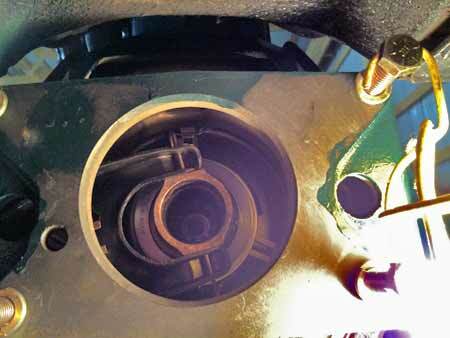 â€“ Looking into the flywheel housing after installing clutch, pressure plate, throw out bearing and fork. Looking up into the flywheel housing after installing clutch, pressure plate, throw out bearing and fork. Before I could mount my transmission into the frame I had to reattach the U-joint that I disassembled when I opened up the transmission. The U-joint is mounted on the output shaft of the transmission and allows the drive shaft to move in any direction during the course of vehicle operation. My drive shaft has two U-joints; one in front and one at the rear near the differential. When I disassembled my U-joint I simply removed the wire circle clips holding the joint bushings in place and then drove out the bushings. Now, however, during reassembly I was having an incredibly tough time finding new wire circle clips. The usual parts suppliers were of no use and neither were the specialty suppliers. 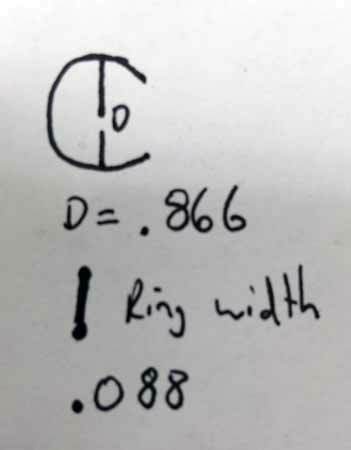 A sketch indicating my wire circle clip needs. Finally, I found a place that carried a good fit but I had to order at least 1,000 clips! That would leave me with 998 extra clips and a bit lighter in the wallet; I was quite frustrated over a 14-cent part! When I called the company I was greatly relieved to learn that a salesman would be happy to send me four "sample" clips for free. U-joint bushings installed and waiting for retaining clips. 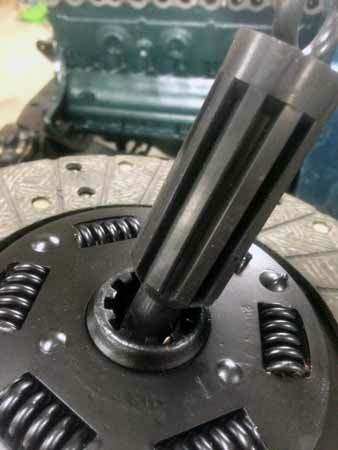 I used a press to install one half of the yoke onto the transmission shaft, installed the interference bolt that secures the joint to the shaft and then reassembled the U-joint using my new clips. Now it was time to get that transmission into the frame. 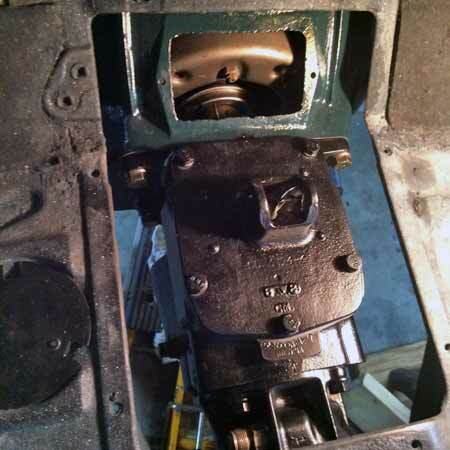 The '37 Buick transmission is fairly heavy, maybe 50+ pounds, and the thought of laying on the ground, lifting the unit and trying to line up the shaft with the clutch plate did not sound appealing. Instead, I placed the transmission on my motorcycle jack and slid it close. Then I went inside the car and reached down through the floor pans to get things even closer. It wasn't easy but, after wrestling with that throw out bearing fork clip, this seemed like a breeze. Once the shaft was properly aligned with the clutch plate I was able to pull the transmission in with the mounting bolts. 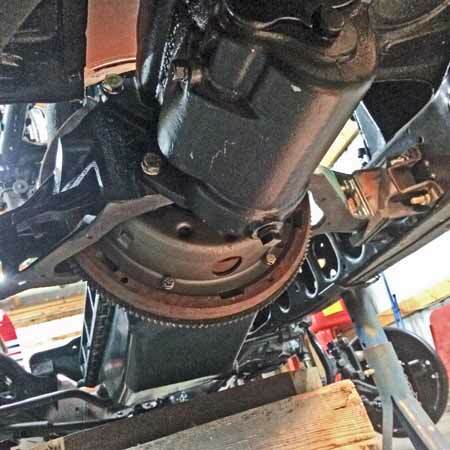 From there I was able to install the frame cross member and new rubber mounts that support the transmission. My transmission is fully installed! Underside view of transmission before installing cross-member. To complete the driveline assembly and make my car look more like a car instead of a frame on stands, it would be time to install the torque tube and rear end. My U-joint allows the torque tube to move in any direction. The joint isn't exposed to the elements and it is contained inside something called a torque ball. The torque ball is comprised of an inner and outer retainer which are two bowl-shaped retainers that are sealed with gaskets and rubber seals. 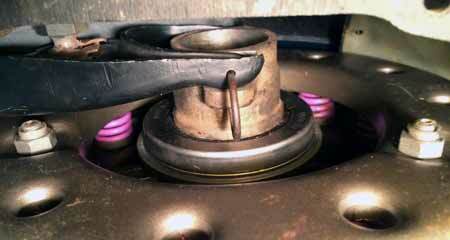 The torque ball is a very common oil leaker on those Buicks equipped with such a device. 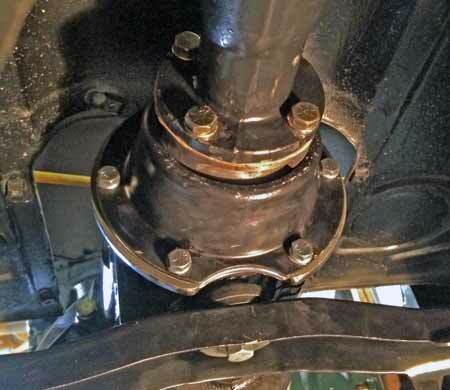 While the parts to fix the leak are dirt cheap, accessing them requires you to completely disconnect the rear suspension and slide everything rearward to gain access. The only perfect time to do this job is during assembly. Lucky me. The torque ball gasket kit contains four gaskets ranging in thickness from .0025" to .0150" and a tapered rubber packing ring that seals the rear of the ball. The shim gaskets are set in place in various thicknesses that will "allow the torque ball to move with some drag." 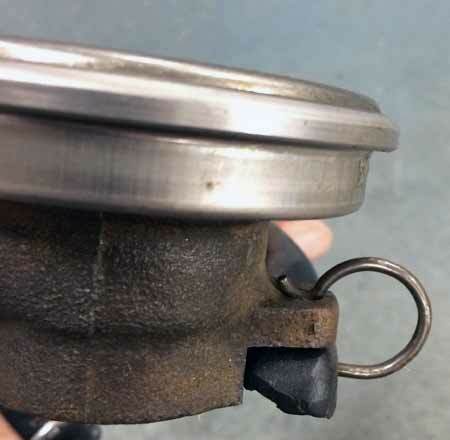 The directions instruct the installer to first place a .006" gasket in between the inner retainer and the transmission, followed by a .0150" & .0025" gasket between the inner and outer retainer. When doing this it is important that the outer retainer is in the proper position and, fortunately the word "top" is cast into the part. The retainers are then tightened down without the tapered packing ring and torque ball movement is checked. After the first attempt my torque ball wouldn't move so I had to add gaskets until I obtained movement with "some drag." To be honest, I forget what my exact gasket combo was but I got it right on my second try. After the correct drag was obtained the ball was disassembled again, the tapered packing was installed and reassembled for the last time. 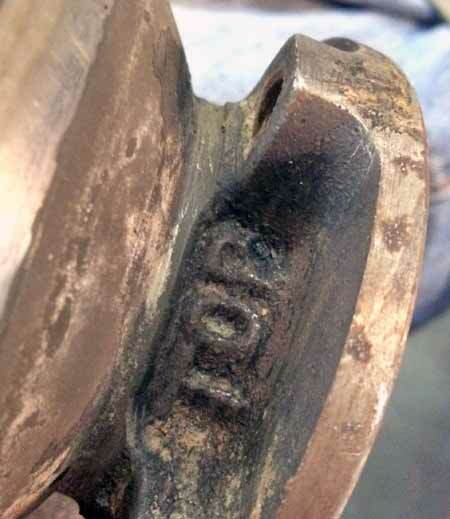 Fortunately the outer torque ball housing was stamped "top" for installation. To complete my driveline I had to attach the torque tube, driveshaft and rear end to the torque ball. This wouldn't be as easy as installing the transmission and I had to get a little creative. With the rear end on the motorcycle jack I positioned and aligned the shaft splines. In spite of my best efforts by hand, I just wasn't strong enough to muscle things together. To be honest, I wasn't even strong enough to get the splines started! 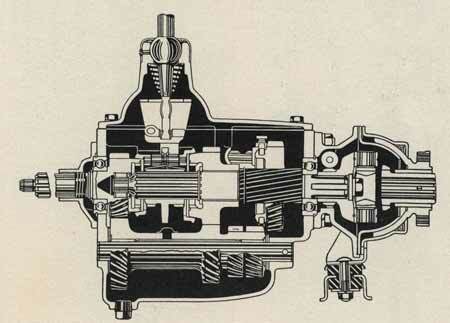 Cutaway view of the torque ball from '37 Buick Shop Manual. To overcome this obstacle I found two bolts that were 4" long. As I tightened the bolts the splines aligned and the shaft and rear end assembly came forward. After a few turns of one bolt I switched sides to make sure it was coming together evenly. Because the bolts were so long I had to switch to shorter bolts the further along the assembly came. Finally, I was able to use the actual mounting bolts and lock washers, pulled things together and torqued them down to SAE specs. Torque ball & torque tube installed. My car is still resting on stands but the driveline is complete. My next step is to install the gas tank while there is plenty of room, then mount the rear suspension and finally install brakes and wheels. Within a few weeks my car could be back on its tires for the first time in years!